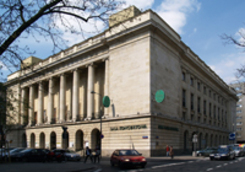 The Warsaw Philharmonic (Filharmonia Narodowa w Warszawie) was founded in 1901 on the initiative of a group of Polish aristocrats, financiers, and representatives of the music world. Notable members of this group included Natalia, Stefan, and Stanislaw Lubomirski, Maurycy and Tomasz Zamoyski, Wladyslaw Tyszkiewicz, Leopold Julian Kronenberg, Ludwik Grossman, Emil Mlynarski, Aleksander Rajchman, and Marian Sokolowski. Architect Karol Kozlowski designed the institution's building in an eclectic style, modeling it on the Paris Opera. A concert inaugurating the activities of the Philharmonic was held on 5th November 1901. The orchestra performed under the baton of Emil Mlynarski with featured soloists Wiktor Grabczewski on the bass and world famous pianist, composer and future statesman Ignacy Jan Paderewski. The orchestra went on to perform with the most famous artists of the period. The National Philharmonic hosted the 1st, 2nd, and 3rd Frederick Chopin Piano Competitions (1927, 1932, 1937), the 1st International Henryk Wieniawski Violin Competition (1935), the 1st Universal Festival of Polish Art (1937) and part of the 17th Festival of the International Society of Contemporary Music. With the outbreak of World War II, the Warsaw Philharmonic suspended its activities and its building was subsequently destroyed. After the war, the ensemble was reassembled in time to perform during the 1947-1948 season. Reconstruction of the Philharmonic's buildingwas completed in 1955 in a new and completely different style than its predecessor. On 21st February 1955, the Warsaw Philharmonic was renamed the National Philharmonic in honor of the orchestra's inauguration of the new season in the new edifice. In the years immediately following, the orchestra was expanded and the concert hall was equipped with an organ. A professional mixed choir was also organized with Zbigniew Soja as its leader. The Philharmonic's art directors since World War II have included Olgierd Straszynski (1945-1946), Andrzej Panufnik (1946-1947), Jan Maklakiewicz (1947-1948), Witold Rudzinski (1948-1949), Wladyslaw Raczkowski, Witold Rowicki (1950-1955 and 1958-1977), Bohdan Wodiczko (1955-1958), Kazimierz Kord (since 1977), Antoni Wit, and Jacek Kaspszyk, the current director. The ensemble of the National Philharmonic has completed over 100 tours that have spanned five continents. It regularly receives invitations to perform at some of the world's most famous musical venues, including the Carnegie Hall, Chicago Symphony Hall, Berliner Philharmonie, Royal Festival Hall, Suntory Hall, La Scala, La Fenice, and Musikverein. The National Philharmonic's other credits include numerous recordings for Polish and foreign record labels, including Polskie Nagrania, Deutsche Grammophon, Philips and CD Accord. Its recordings for the latter company in particular have brought it a number of distinctions. Award-winning albums have featured both Polish music, represented by the works of Chopin, Szymanowski, Gorecki, Lutoslawski, Panufnik, Penderecki and Szymanski, and pieces from the world repertoire, among them the complete symphonies of Beethoven. The National Philharmonic's achievements also include a number of world premiere recordings, the most notable among these being Krzysztof Penderecki's Seven Gates of JERUSALEM and Roman Maciejewski's REQUIEM – MISSA PRO DEFUNCTIS. Each season, the Philharmonic organizes many symphonic concerts, recitals and chamber music evenings. These invariably involve the participation of some of Poland's most exceptional musicians as well as artists from around the world. One of the more important events organized each year at the National Philharmonic is the Lutoslawski Forum, which features concerts of 20th century music and a number of exhibitions, lectures, and panel discussions. The Philharmonic also makes an effort to reach out to young people by organizing the Thursday Music Meetings and Sunday concerts for children. Warsaw Without Barriers and Via Spei are the Philharmonic's concert series for people with disabilities, while its Blue Concerts commemorate the creation of the United Nations. The Philharmonic also plays an educational role, organizing thousands of concerts in schools and cultural centers throughout the country. The National Philharmonic is one of Poland's representational musical institutions and, as such, regularly plays host to music lovers from around the world.